Just in Time Production is a popular manufacturing strategy with the MBA crowd. It's also a popular strategy for the procrastinators among us. 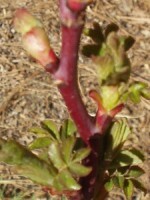 At the Santa Fe Master Gardener's Fair this spring I saw a simple demonstration of how to build an inexpensive (Woo Hoo!) 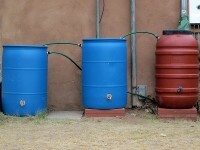 rainbarrel. One of the first things I did after moving in to our house over 10 years ago was plant a small bed of culinary herbs by the front door. Some of these perennial herbs have thrived, while others didn't. Two thyme plants have survived in this planter and grown bigger after some of their competition was frozen two winters ago. 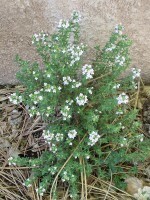 These small and subtle herbs bloomed with small and subtle white flowers this spring. 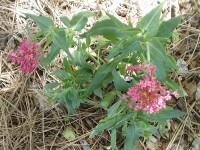 Here's another small but hardy perennial native growing in our front yard. You won't find Sulphur-flower Buckwheat in your morning pancakes (the food crop Buckwheat is another genus) but it is native to the western U.S. 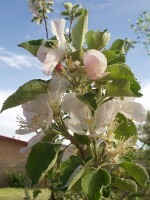 While it's not indigenous to New Mexico several varieties grow in Arizona, Utah and Colorado. 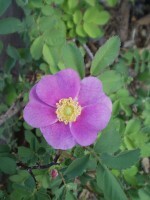 The little plant in our front yard decided this was a good year to display it's namesake blooms. Golden Columbine is flowering in our yard. Columbine (species - Aquilegia) are high-altitude perennials native to the Northern Hemisphere. 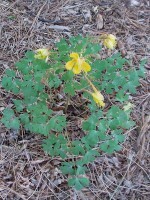 Golden Columbine is indigenous to the Southwestern U.S. and is growing well around our house. Jupiter's Beard blooming in the front yard. 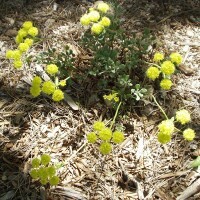 This perennial shrub is naturalized in the American Southwest (a native to the Mediterranean) and has grown slowly, but steadily, since we planted it. Planting a garden each spring is a wonderful start to the growing season. We can choose new annual crops based on what grew well (or didn't) last year and whatever looks interesting or unusual. 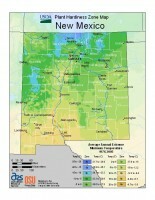 Planting trees and perennial crops requires more planning. Some perennials like strawberries will bear fruit the year they're planted, but fruit trees can take two or more years to bear a crop. Being an EcoDaddyo, and a cyclist, I bike around our fair city whenever possible. Given the short in-town distances we drive, biking is an easy alternative. Recently, we enrolled our eco-kid in daycare and I'm usually on pick up duty. 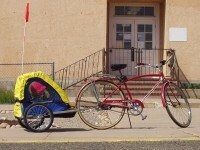 I was happy to find that this is easy with our new dad-powered, bicycle-pulled kid trailer.